Nissan Leaf electric car on video | What Car? We take a test drive in the all-electric Nissan Leaf. Watch the video here. 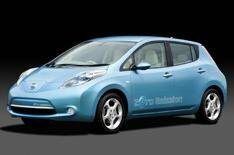 Nissan has taken a decisive step into the motoring world of the future with this, its soon-to-be-released Leaf. Although on the surface its hardly the most radical looking machine, what lies underneath is astounding, because the Leaf is the worlds first mass-production all-electric family car. Is it the future of motoring? Watch our video to find out our initial thoughts.